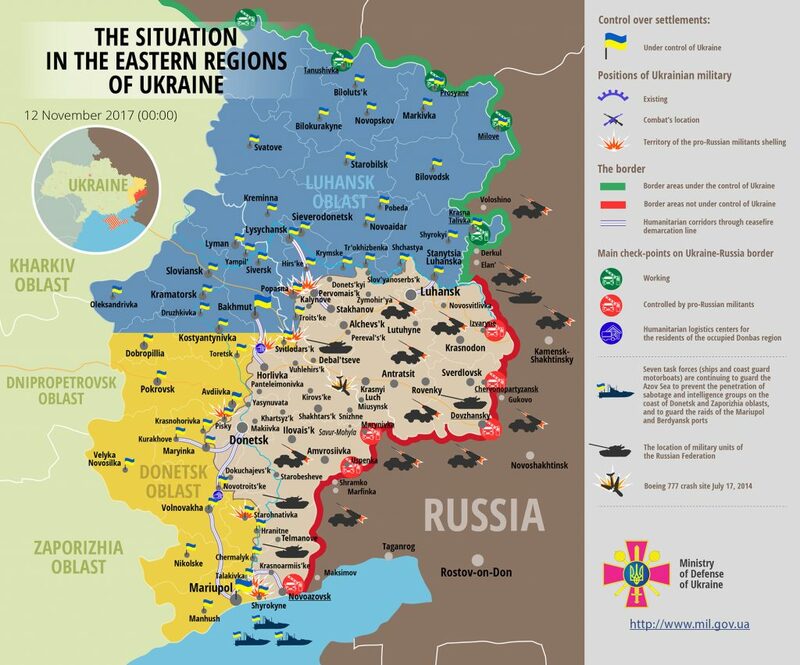 Russia-backed militants continued openly attacking Ukrainian positions using Minsk proscribed weapons. “One Ukrainian soldier was wounded in a hostile attack near Zaitseve. The casualty was promptly evacuated to military mobile hospital. In total, the enemy conducted 18 aimed attacks at Ukrainian positions along the entire frontline. Ukrainian troops returned fire in 11 cases,” reported Ukrainian Ministry of Defense spokesman on ATO Colonel Oleksandr Motuzyanyk at a press briefing at Ukraine Crisis Media Center. In Luhansk sector, militants conducted 12 aimed attacks at Ukrainian positions. They fired four 120-mm mortar rounds at Ukrainian troops near Travneve, and four 82-mm rounds near Zaitseve. “Moreover, multiple hostile attacks involving heavy machine guns, grenade launchers, and small arms were recorded in the same area. Russian proxies used the same weapons to attack our troops near Luhanske, Novooleksandrtivka, Maiorsk, Lozove, Katerynivka, and Novoluhansk,” added Col. Motuzyanyk. Moreover, militants attacked ATO troops’ positions with IFV weapons in Popasna area. In Mariupol sector, Russian proxies attacked Ukrainian troops six times. They shelled Ukrainian positions near Pisky with 120-mm and 82-mm mortars, firing a total of eight rounds. ATO troops’ positions near Shyrokyne and Vodiane came under 82-mm mortar fire. Militants shot seven rounds, and used IFVs and later 23-mm double-barreled antiaircraft gun ZU-23-2 near Shyrokyne. “Militants also used mounted and hand-held grenade launchers, machine guns, and small weapons to attack Ukrainian positions near Novoselivka Druha and Starohnativka,” added the spokesman. Ukrainian returned fire using weapons not proscribed under Minsk agreements when there was direct threat to Ukrainian troops’ lives. Meanwhile, the ceasefire held in this sector in the afternoon. Report on the military developments as of November 11 is available here. Interactive data on the shelling: chronology shelling chart and the interactive map.